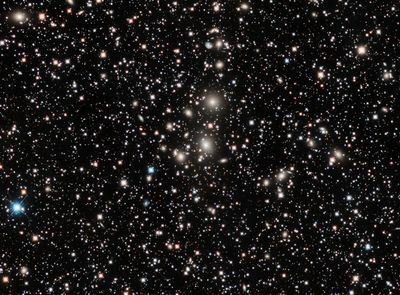 This image of the Perseus cluster of galaxies, also known as Abell 426, is centered on NGC 1275. NGC 1275 is a giant elliptical galaxy, which is a radio source and x-ray emitter. Abell 426 is part of the Pisces-Perseus supercluster, which contains over a thousand galaxies. The image is a total of 9 hrs exposure with a Takahashi CCA-250 f/5 astrograph and a QSI683wsg camera (Astrodon Gen2 filters) on a Paramount ME taken on the nights of 7 Nov, 3, 13 Dec 2018 in Mayhill, NM (18 x 1200 sec lights; 3 x 1200 sec R, G, and B at -20 degrees; 24 darks; 128 flats; 128 bias). Processed with PixInsight 1.8.5.1353 Ripley (x64).